Hida Viloria | Intersex Awareness Day is this Thursday! Intersex Awareness Day is this Thursday! Hi everyone! So many of you have reached out to say supportive things about my activism that I thought I’d let you know that this Thursday, October 26th, is Intersex Awareness Day (IAD), and I would love, love, LOVE it if you could post or tweet something that day on your social media channels (using #IAD2017 on twitter). I’ll be posting info. here all week to assist, and thanks in advance to all of who do! 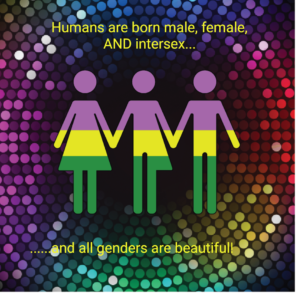 <3 <3 <3 Your support and public acknowledgement makes it safer for intersex people to live openly as who we are, and for intersex babies and children to avoid being subjected to medically unnecessary, damaging, irreversible surgeries and other medical practices meant to erase their intersex status. For starters, I LOVE the U.N.'s Intersex Fact Sheet, which I’m proud to say I helped edit, for a brief, general overview of intersex people and our human rights issues.